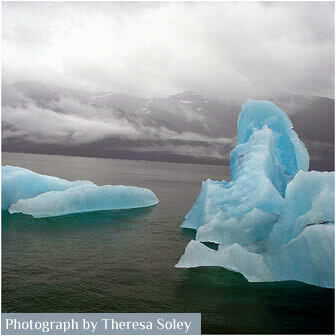 Alaska Cruise Series of Alaska Tours and Excursions. Tracy Arm Fjord Tours, Juneau Alaska. Tracy Arm rates towards the tops for many visitors arriving via cruise ship to Alaska each summer. Cruising the Inside Passage in Alaska often includes a the Tracy Arm Tour where you see the Twin Sawyer Glaciers, Icebergs, amazing waterfalls and lots of marine life too. Tracy Arm Cruise is a Dream Come True and deserves to be included in Alaska vacation itinerary. A much-loved day trip for travelers to Southeast Alaska is hopping on a boat to Tracy Arm Fjord. A fjord is a thin glacial sculpted valley that has filled with seawater. It provides a unique view, as the narrows are dominated by extensive rocky walls on both sides. At the end of the green fjord you are rewarded by two active glaciers, Sawyer and South Sawyer. Both glaciers are rapidly receding, meaning that calving (when chunks of ice plummet from glacier into water) events are common. On a boat trip to Tracy Arm you will pass thriving waterfalls, sunning harbor seals, and likely witness gigantic calving events. The opening to the fjord is located about 45 miles south of Juneau where the boats depart from. The trip lasts nearly the entire day with about two hours of travel time in each direction. When traveling toward the arm, orca and humpback whale sightings are possibilities. Once entering the fjord, though, whale sightings are rare. 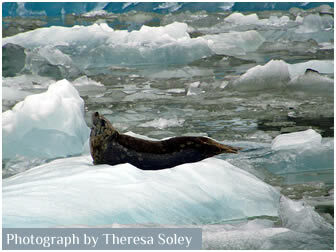 As a result harbor seals have found a safe haven, resting on icebergs near the glacier’s face. It is thought that orcas, whom utilize echolocation clicks to encounter their marine mammal prey, can’t distinguish between floating ice and seal food. In the spring and early summer young seal pups may be seen upon icebergs nuzzling their mothers for milk. Arctic terns, small gull-like birds who travel long distances in their migrations, feed upon krill near the glaciers as well. Mountain goats, whom sometimes descend the steep cliffs, may be spotted nibbling upon lichen. You never know what kind of wildlife you will see, as animals are of course unpredictable! 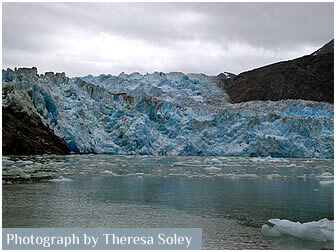 When John Muir ventured into Tracy Arm fjord he noted just one glacier, rather than two. This suggests that in less than a century the immense twin glaciers were just one, both having now receded at least five miles in a short period of time. Because the two are receding so rapidly, this tidewater glacier is one of the best places to witness powerful calving events with your own eyes, and feeling the strength of ice that shapes ecosystems. When the glacier calves it grumbles and cracks, sounding sharper than thunder. The entire glacier faces are sealed by icebergs that the boat captain will attempt to maneuver in order to provide visitors an inspiring view. There are two boat companies that offer tours to Tracy Arm. One, Adventure Bound Alaska, travels on small 55 to 65 foot boats. The alternate option is Allen Marine Tours, which sends larger boats on this trip. While Allen Marine is a larger boat company, they do provide a naturalist on their trips to share natural history and ecology of the region. Whatever your choice to Tracy Arm, you will certainly be moved by the thin green fjord and powerful ice. shut in by sublime Yosemite cliffs, nobly sculptured, and adorned with waterfalls and fringes of trees, bushes, and patches of flowers, but amid so crowded a display of novel beauty it was not easy to concentrate the attention long enough on any portion of it without giving more days and years than our lives can afford. Adventure Bound Alaska, travels on small 55 to 65 foot boats. Allen Marine Tours, which sends larger boats on this trip. Holland America offers itineraries with day trips deep into Tracy Arm Fjord. Princess Cruises also sails into Tracy Arm offering luxurious surreal voyages in Tracy Arm Fjord.